The four photos at the foot of the Great Siege memorial. The nephew of Raymond Caruana has expressed the family's anger at the fact that his photo was put next to others at the makeshift shrine to Daphne Caruana Galizia outside the law courts. In a Facebook post, he said it was shameless for his uncle, gunned down at a Nationalist Party club in 1986, to be used to score a point. 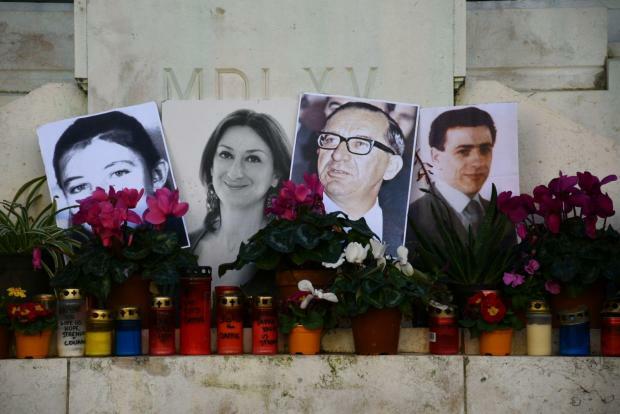 Photos of former Prime Minister Dom Mintoff, Mr Caruana and slain teenager Karin Grech were put up on the shrine, ostensibly by people wishing to make a point about its location, as well as its very existence. 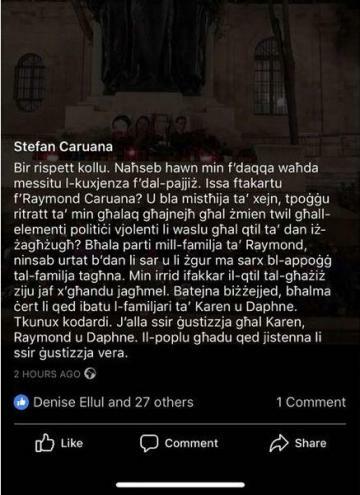 Stefan Caruana said it was shameful to have his uncle's photo put alongside that of somebody who had "for many years ignored the violent political elements" which had led to his death, in reference to Mr Mintoff. He appealed to people to be brave, saying the Caruana family had suffered as much as Ms Caruana Galizia's and the Grech family. "Those who want to commemorate the murder of this youth know what they have to do," he wrote, saying he hoped that justice would one day be done. Raymond Caruana, 26, was shot dead on December 5, 1986, as he was celebrating at a reception marking the opening of the club. The weapon was allegedly fired by an individual taking part in a Labour Party carcade who aimed his submachine gun at the club façade. Thirteen shots were fired at the club from a passing car, shattering a glass door and killing Mr Caruana. No one was ever convicted of the murder.